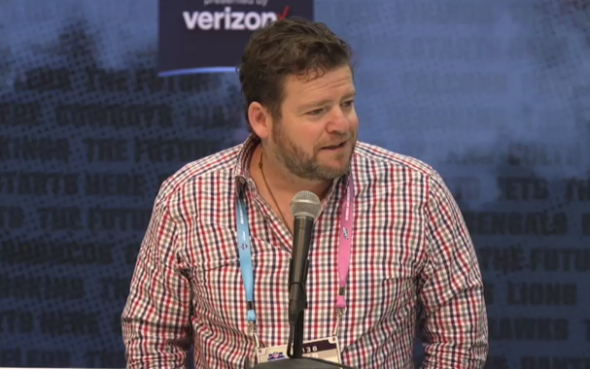 GM John Schneider at the combine bragged up Seahawks as “elite place.” Perhaps in case Russell Wilson’s agent thinks New York is a bigger deal. The biggest asset was franchise ownership by Paul Allen, whose stability, wealth and wisdom to know what he didn’t know, was the most important element in the Seahawks’ success and prosperity. Thereafter, his contribution was what he didn’t do — interfere with the good football people. That virtue cannot be underestimated. When the NFL fan looks around to the operations of the 49ers, Cowboys, Browns, Raiders, Redskins, Colts and Cardinals, to name a few, the imagination conjures up clown cars. Longtime Seattle fans dare not get smug, because from 1988 to 1997, the clown car was parked here after the original owners, the Nordstrom family, made the mistake of selling to Behring. Front-office dysfunction, family politics and meddlesome egos don’t automatically disqualify franchises from winning championships. The messes just make winning big harder. Even well-run franchises, such as the Steelers, can get haywire sometimes. In the long run, Allen’s tenure was as close to ideal as can be reasonably expected in the NFL. Now, it may be different. The death of Allen Oct. 15 means this is the first off-season without his leadership. His absence doesn’t necessarily mean trouble or triumph, for the moment. It just injects some uncertainty about the future. The reason for discussing it now is because Schneider, the general manager, thought to bring it up Wednesday at the annual scouting combine in Indianapolis, where his custom is to take a turn at the podium for 10 to 15 minutes of answers to media questions. Responding to a query about whether today’s players require changes in recruiting tactics, Schneider said he didn’t think so, and elaborated by talking about why his franchise is so wonderful, hailing fans, ownership and Carroll’s coaching. “Maybe I’m a little old school, but I don’t think it’s changed a ton,” he said. “Our stadium, as loud as it is — the fan base is incredible. Ownership’s been unreal. We lost Paul, miss him a ton, but we’ve been working with Jody, his sister. She’s been amazing. I don’t know that I’ve heard Schneider cheer-lead quite like that. Having made the playoffs in seven of the past eight years, which includes two Super Bowl appearances, makes a case that he’s entitled. But that was then, and the future is nearly upon them, because soon enough, they will have to decide if they’re up for the privilege of having the highest-paid player in NFL history, then learn whether Wilson wants that privilege while remaining in Seattle. Schneider’s message was directed, more or less, to Wilson to help convince him to stay. Schneider wants the quarterback and his agent, Mark Rodgers, to know publicly that nothing has changed after Allen’s death. Jody Allen, Paul’s sister and primary heir, is chair of the Paul G. Allen Trust that owns the team. Bert Kolde, Allen’s longtime friend, is the vice chair. Jody Allen has yet to make a public statement in her new role, but the organization has said the club isn’t for sale. Which is, of course, true until it isn’t. Since Wilson’s contract is up after 2019, Schneider predictably said while he’s been in touch with Rodgers, his first priority is the Seahawks’ unrestricted free agents now, including DE Frank Clark. That was a reference to a rumor last week that Wilson, presumably via trade, wanted to join the Giants in New York, mainly because his pop-singer wife, Ciara, thinks it’s better for her career. The popular speculation was that the story was planted anonymously with Fox Sports radio host Colin Cowherd by Wilson’s agent, who wants to stir the marketplace. So Schneider responded figuratively with his “nuh-uh, we’re still the cool kids” retort. Irrelevant as was the Giants rumor, it did make a point about tactics from those who would benefit by separating Wilson from the Seahawks. Even though the first public act by Jody Allen was to approve the extension through 2021 of the contract of Carroll, who has shown zero loss of energy or passion for the game, he remains the league’s oldest coach at 67. More immediately, the Seahawks so far have the NFL’s weakest draft hand (four picks), fewest in club history. They have big room ($50 million, eighth-most in the NFL) under the salary cap, but a lot will go to extending Clark and others. Some room might have to be made for Wilson, should talks conclude this summer with an extension that includes new guaranteed money in 2019. Still, it’s going to be tough to get better in 2019. Someone might offer the argument to Wilson that he might be better off forcing a move now to a team on the rise instead of a sticking with a team that peaked with an unexpected playoff appearance. With a new owner of unknown long-term passion and a franchise value that could fetch upon sale almost $3 billion for the foundation, Wilson might be well advised to break out of the pocket and seek the long-term owner/coach stability that helped him thrive in Seattle. Presuming, of course, that it exists elsewhere in the NFL. Wilson’s remarkably efficient season in 2018 demonstrated he’s at the apex of his game, even if he has lost a step of speed. If anyone deserves a contract extension averaging $35 million a year, it’s him. The bigger NFL question is whether any team paying that much to one player under the cap can be a consistent winner. None among the six highest-paid QBs made the playoffs last season. The smaller Seattle question is whether Allen might get creative and use her new influence to talk to the Oak View Group, creating a new arena at Seattle Center, to see whether they might want to have Ciara as the headline act opening the new venue in spring 2021. It’s not New York, but Schneider says Seattle is an elite place. And Ciara’s talent fee wouldn’t count against the cap. I hope Jody stays on with the team and I bet some in the NFL hope so too. Currently there are nine women among the NFL owners (not including the publicly owned Green Bay Packers) and two who are of color according to Wikipedia. Overall it’s still largely the territory of older white men. It would benefit the NFL to have the person holding the estate of Paul Allen to stay on as well as be in the best interests for the Seahawks and the 12th Man. Paul let his football people do their football thing. It’s a pretty easy gig really and she most likely understood how Paul worked well enough to where she can handle the business side of things. I don’t treat the NY rumor seriously though a bit surprised that the Wilson’s haven’t refuted it. (To my knowledge.) I don’t think Russ has much interest in going to a larger market and Ciara is only a four hour flight away from LA. So I toss that news bite where it belongs: right onto the lousy turf of Levi’s Stadium. There is a good foundation for a winning team by committing to a younger core group who don’t have the same distractions and agendas as past Seahawks. I’m a bit concerned for some of the veterans on the team currently but to get past being a good team to being an elite team hard decisions will have to be made. It would good if Jody declared her intentions, but the Allen empire is colossal, and the Seahawks are a small fraction. I suspect her silence is wise until the trust is clear about objectives. When the Seahawks are sold it would be fun to have the team go public. Sell shares in the team similar to the Green Bay Packers Football Club. I would buy a certificate of ownership. I honestly think the cap is ridiculously low. Raise the cap so teams can keep quality players with a history with the team. Parity doesn’t have to be mediocrity and excellence should be rewarded not punished. Raising the cap might help. It might also just raise the salaries for star players even more, and the ability to keep teams intact won’t improve. And a lot of owners would be opposed to a cap raise, I imagine. You’re right — more money raises the ceiling, not the floor. The NFL and every other pro sports org will never allow another public ownership. They don’t want their business dealings made public, and the even fans shouldn’t want decisions made by amateurs with no dogs in the hunt. The cap is a reflection of collective bargaining. It’s what owners and players agree is fair. To achieve your goal of redistribution would require players and owners to take rev/income cuts. Not likely. The NFL, and the other pro leagues, have barred public ownership of teams going forward, both the Packers style and a corporate ownership (say, if Microsoft bought the Hawks instead of Allen). The rationale is that public ownership gives a team an unfair advantage over the privately/personally owned teams; they can issue new stock if they need more cash, while the private owners are stuck with what they already have in the bank. The Packers are grandfathered, so their public ownership is safe … at least until some gazillionaire initiates a hostile takeover of their shares and turns them private, which has happened to more than a few English soccer teams (to the anger of their fans). All true. The fantasy of public ownership, however, will not fade from some fans. The uncertainty over the long-term ownership of the Seahawks is a legitimate concern when it comes to re-signing Wilson, but Art, do you think Jeff Bezos is a legitimate possible buyer of the Seahawks and if not, who do you think are potential buyers? Jody Allen has every right to take her time to find the right buyer but how can one not be leery of a Seattle team owner (Nordstrom and Schultz) making a disastrous sale to a less than reputable buyer (Behring and Bennett)? Bezos has shown zero interest in sports. My guess is he would find team ownership a distraction. And he’s not a native of Seattle, where you may have read he’s had some trouble with politicians. I have no clue who might bid. But I’ll guess that it would be a a tech titan a step removed from the headlines, something like Microsoft’s Chris Larson was when he he bought a chunk of the Mariners in 1995. I’m not even sure Bezos knows the Seahawks exist. If he had even the slightest interest in sports, he certainly would’ve tried to buy the Sonics from Schultz, or partnered with Chris Hansen in the SoDo effort, with loose change he scraped up from under his sofa cushions. Either would’ve saved a LOT of headaches for sports fans. Being in tiny markets sure hindered the marketability of Aaron Rogers and Peyton Manning. I only see them in every other ad break, not every one. Also, not being in New York or LA sure hurt the careers of all these tiny Seattle based artists. My guess is Ciara is not particularly concerned about TV commercials for Wilson or other football players. Nor should Seahawks fans be particularly concerned about the NY rumor. Now, the rumor about Wilson succeeding Phillip Rivers with LAC . . .
I’d be worried about the NY rumor. Eli’s career is winding down, and I think the impatient Giants fans would like his replacement to be a proven winner instead of a rookie. I’d cry if Russ left, and I don’t know why Art has to keep bringing cold, hard facts to the discussion. It’s like we’re damned if we lose Russ, and damned if we pay to keep him. I just keep thinking that that Carroll-Wilson symbiosis is special and either is not going to thrive without the other. Is it possible that they realize that and can somehow make it work while not bankrupting the rest of the team? I guess I can’t blame anyone for seeking to max their salary, including Russ, but Russ has also taught me to believe in miracles. Make it happen, Russell! Premier QBs in their prime present a salary cap problem, although Brady’s willingness to play for less than market has been helpful. Wilson and Carroll understand their mutual advantages, and their agents understand nothing lasts forever. I have a feeling that the Seahawks will remain in Allen control, but not the Trailblazers. The Seahawks survived a transition this season and won 10 games. I expect with Carroll and Schneider in control that they will weather a transition when the time comes for Wilson to either re-sign with Seattle or move on. Carroll and Schneider have indicated no wandering eyes, although pursuit of them is steady and helpful in inflating their compensations. Seems pretty clear to me that the template for a successful NFL quarterback is having height at least 6’3″, a strong accurate arm, with a fast brain that is capable of making very quick post-snap decisions using their high football IQ. Brady, Flacco, Matt Ryan, Rothlisberger, Foles, Rivers, etc. are living proof. Russell has all of those but the first, and that’s a problem. Brady’s performance in SB53 (through the play-offs really) was a master class in using the above stated qualities to move the ball (without superstar teammates) to score enough points to win a championship. A tall immobile QB with quick, wiry receivers who create a little space in 2.5 seconds can win you rings. A well coached offensive line didn’t hurt either. I’m okay if Russell leaves. Yes, he is elite. But he isn’t that elite. He seemed distracted some games last year, and that’s another problem. I would be fine releasing him and using the money elsewhere. Look at what happened to this team after his rookie contract expired. No money for offensive line contracts which lead to HUGELY embarrassing performances. I get it. He’s been to two Superbowls (with THE elite defense in the league). But Brady is the template we should be pursuing. The model is there. Follow it. Just let me know when you’ve discovered the next Tom Brady to fit your formula. Actually, you’d make more money selling it to teams. Until then, the Seahawks can live well with Wilson’s, ahem, shortcomings.